I am a Halloween fantasy artist that paints in acrylics on wood items, such as boxes, lamps, tea chests, receipe boxes, innkeepers signs, regular wood signs and much more. I also do halloween canvas paintings from small to medium range sizes. 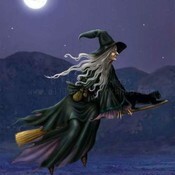 I paint Witches, Bats, Black Cats, ghosts, unicorns, all halloween scenes and most things that go bump in the night. I humbly say I have become sought after for my halloween artwork, especially my Black Cat paintings. It a great honor to know that there are those that like my artwork. I have been selling my halloween and black cat artwork worldwide and now I have been invited to sell on Bonanzle. My work is original and each work is a OOAK (one of a kind) and comes signed by me and dated. I ALSO PAINT BLACK CAT CHRISTMAS AND WINTER ITEMS ALONG WITH WITCH WINTER ITEMS.So check in with me in the winter season also to see what I have for sale in those catagories. I'm excited about meeting new buyers and sellers here so browse thru my booth and enjoy. Let me express a BIG THANK YOU to all my regular followers and buyers. Because if it were not for you, I would not be doing what I like to do best and that is painting halloween and black cat artwork for all those that enjoy it. halloweenartstudio doesn't have any items in their booth! I believe certain people’s lives cross for many different reasons. I have had the honor to meet Barbara thru Bonanzle. She is as beautiful inside as she is on the outside. Her artistry and kindness knows no bounds; her strength is amazing as well as inspiring. I’m priviledged to have met and gotten to know this lovely lady. Yes, there are angels amongst us. Look at the picture at the top of this page. I have recently met Barbara and she has proven to be very congenial. Her OOAK pieces of art are truly incredible. If you are a halloween buff this is the place to shop. A very pleasant and smooth transaction, fast payment, great communication, highly recommended! Awesome Buyer and Wonderful Sweet Person to do business with! Has a beautiful booth with some incredible artwork must see. Wishing you much success on Bonanzle! This is a very talented artist! Don’t miss out on the chance to own original art at low prices! If you (or someone you know) is a big Halloween fan – now is your chance to own some wonderful art! This is a very nice lady with incredible artwork. She’ll be a huge hit especially as Halloween approaches. It is apparent that she is very eager to please and happy to be on Bonanzle. Always kind and polite in communications.